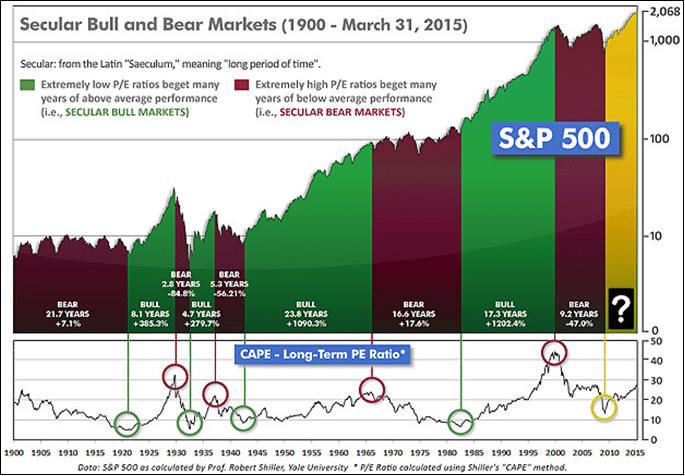 Despite its age, the current bull market in stocks is still alive. Historically they average 39 months, but at 62 months the current one is not showing any signs to indicate the end is imminent or as we call it, Major Market Top. 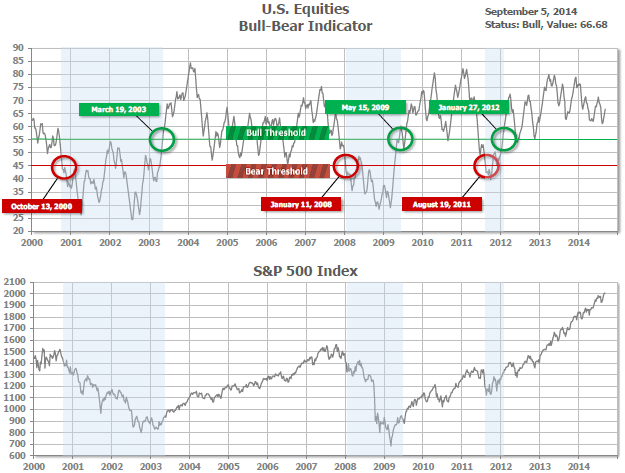 In recent months, market pundits have been calling for a Bear market (decline) in stocks simply because of the current Bull’s age. In past commentaries I have explained the historical pattern of how markets erode over time until the end finally does arrive. While it’s true that the bull has aged quite a bit, our studies suggest he still has life left in his legs. Corporate earnings begin to decline. Currently, revenue growth is difficult but corporate earnings per share continue to increase due to cost cutting and the implementation of labor saving technology. Gas prices go back up causing consumers to cut-back on spending. Weak labor markets persist along with the poor quality of jobs being created. Consumers fear tougher times ahead and decide to save more and spend less. It appears that most of the money saved on lower energy costs has in fact been saved not spent. The Federal Reserve decides to take the punch bowl away and begins a cycle of interest rate increases. With global deflation the order of the day, we think this is unlikely in 2015. A geopolitical event causes havoc. These cannot be forecasted, and the current ones (ISIS, Iran, Syria, Afghanistan, and Ukraine) are inconsequential. We constantly worry about which economic perils lurk around the corner and we attempt to model a multitude of economic data points in order to glean insight into what the future holds. However, the greatest prognosticator and most reliable predictor of future economic activity is the market itself. The stock and bond markets are discounting mechanisms that adjust their prices daily with a pattern emerging over time. This pattern is visible to those watching for it. Over the years I have written many times about the market’s ability to forecast economic conditions 6-12 months into the future in a way that no person or group of persons can. With this in mind, our studies suggest that the stock and bond markets have been consolidating within a trading range. There has been a lot of volatility for the last two months with upward and downward surges. However, our study of the interaction between buyers and sellers reveals that while there has been a lack of buyers sufficient to sustain another leg higher in prices, there has also been a commensurate withdrawal of sellers which removes the risk of a sustained move lower in prices. Historically this kind of pattern resolves itself to the upside. So in the weeks ahead, we expect an eventual breakout of the S&P 500 to new all-time highs. We are also aware that it may take one final flush-pullback to the bottom of this two month trading range before that happens. Aging stock markets bear special risks upon 401k and IRA accounts. If you would like to review the mutual funds held within your 401k, IRA or Variable Annuity for potential exposure to these risks, feel free to call me at (914) 761-3237. In previous letters I’ve written about how the current long-term uptrend of the stock market is beginning to show signs of age. I’ve characterized it as “getting gray around the temples.” What it means is that slow, albeit subtle, change is taking place beneath the surface and this change is not being reflected in the major stock averages such as the S&P 500. The result is that the stock market’s risk level is slowly beginning to rise undetected by most investors. The risk I’m referring to is the historical pattern whereby market erosion usually begins in the small cap stock segment, eventually spreads to mid-cap stocks, and finally to large-cap stocks. As this pattern unfolds, investors don’t realize it’s happening because the S&P 500 continues to rise to a new all-time high. So, small-cap stocks and eventually mid-cap stocks decline under the cover of a rising S&P 500. This happens because the S&P 500 consists of large-cap stocks which are usually to last to succumb to intense selling. Market indicators we follow have been telling the story of slight deterioration in the mid-cap segment but substantial deterioration in small-cap stocks. 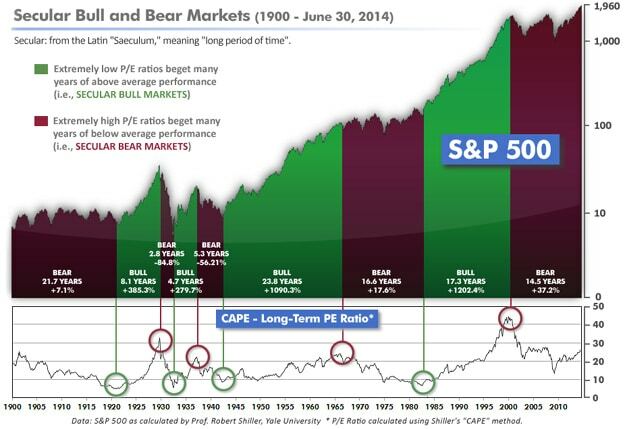 This is one of the early warning signs of an eventual major market top, and resultant bear market. However, it’s important to note that the more advanced signs of an aging bull market have yet to appear, signaling that many more months remain in the primary uptrend. With this cycle of erosion in mind, an investment strategy must be in place to deal with it as it occurs. As I’ve said, we have already been seeing substantial weakness in the small-cap segment. Therefore, each time the S&P 500 achieves a new all-time high, investors should review their IRA and 401k accounts, looking for any stocks or mutual funds, particularly those in the small-cap segment that did not also rise to a new high. After closer inspection, if signs of sluggishness exist such as poor relative strength, they may be candidates for culling. Generally speaking, once stocks begin to underperform in an aging bull market, they rarely regain their former strength. To repeat, large company stocks are usually the last to weaken as a bull market ages. Therefore, a process of culling weak performers and reinvesting the proceeds into large company stocks within the strongest industry groups and sectors should be done on an ongoing basis. This disciplined process of upgrading your IRA or 401k should be done throughout the remainder of this aging, yet resilient bull market. Failing to do this could cause serious harm to your retirement account and retirement goals in general. As an aside, this process of culling and upgrading should be a key component to every investor’s strategy regardless of where we are in the market cycle.